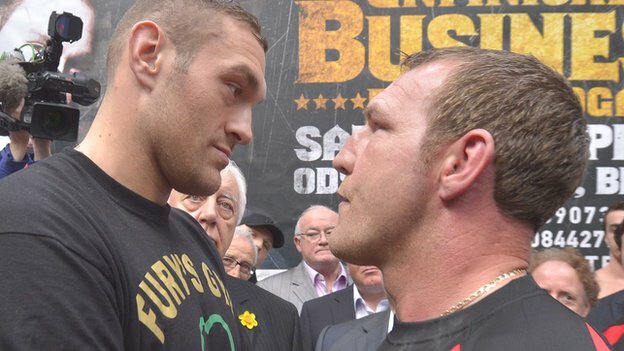 Tyson Fury has stopped Martin Rogan in the fifth round and in doing so he became the Irish Heavyweight champion. Fury started the fight as a southpaw and unlike his recent fights he showed a lot of patience and kept his hands up to avoid being hit by the big punches that hurt him in his last few fights. Fury gave away the first two rounds to Rogan but in the third round he finally let his hands go and he dropped Rogan with a straight left hand. Fury then dropped Rogan in the fifth round with a left hook to the body which prompted Rogan's trainer to climb into the ring to stop the fight. This fight wasn't as exciting as Fury's recent fights but he showed good composure and punching power out of the southpaw stance. Were you impressed with the new Tyson Fury?